You are here: Welcome-to-KYOTO .com > The Horikawa River will be transformed into a fantasy world. The Summer Events – “Kyo-no-Tanabata” start. Note: A schedule changes by each event. “Kyo-no-Tanabata” is a collection of events held in August. The events are designed around the theme of “Wishes,” in honor of the tradition of “making a wish once a year.” It is a ten-day event full of magical productions of bamboo and light, where visitors can enjoy the tradition of Tanabata in true Kyoto style. The Tanabata legend tells of two lovers, Hikoboshi (Altair star) and Orihime (Vega star), who are separated by the “river of the heavens” (Milky Way). They are allowed to meet once a year, on the night of July 7 in the lunar calendar. —That means around August 7 in the today’s solar calendar. The Chinese celebrated Kikkoten, where people would pray to the star of Orihime for proficiency in skills such as needlework and calligraphy. This tradition travelled to Japan during the Nara Period and was combined with a Bon Festival event called Tanabata, which involved loom-weaving for ancestral spirits. This is said to be the origin of Tanabata in Japan. 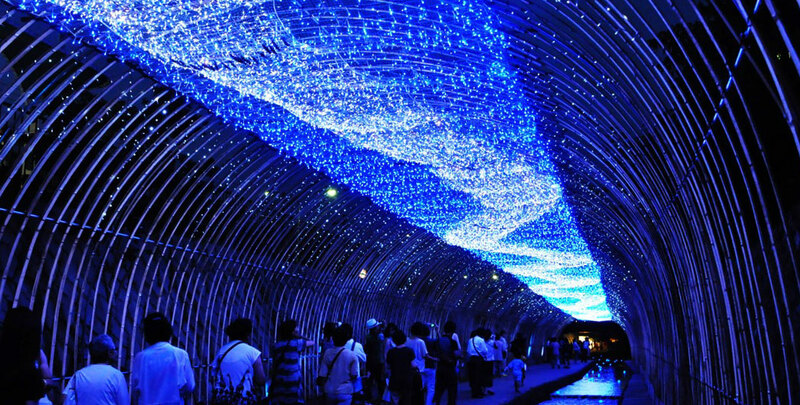 The Horikawa Site will offer romantic productions such as the “Milky Way of Light,” which replicates the beautiful Milky Way full of stars, and the “Yuzen Nagashi of Light,” which embellishes Horikawa River with light and beautiful Yuzen silks. Illumination Hours: 7:00 P.M. to 9:30 P.M. The walkway along Horikawa River (Oshikoji -St. to Ichijo Modribashi Bridge). During the event period the Walking Path will be one-way to the north only. Therefor we suggest to enter the path from the Oshikoji Entrance where right in front of the No.2 Exit of Nijo-jo Mae Station(T-14), Subway Tozai Line. 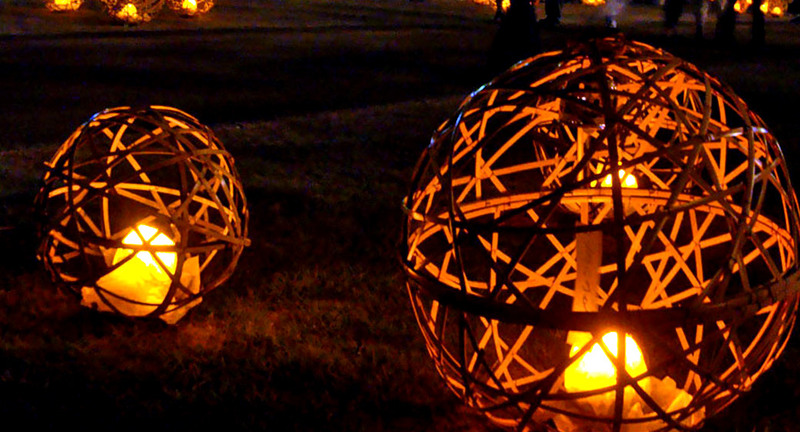 There you will also find the paper lanterns gate as a marker. And if you also like to visit “Illumination of Ninomaru Garden” in Nijo-jo Castle, you should visit the Nijo-jo at first. Otherwise you will have to come back all the way long since Horikawa path is one way to north. The Kamogawa Site will create a wondrous world with productions such as the “Furinto,” a wind chime installation of refreshing sounds, and the “Walkway of Bamboo and Light,” an enchanting path of illuminated bamboo shoots. — Open to the public for the first time. Ninomaru Garden, which has the most cultural value of all historical gardens still existing in Japan, will be illuminated for the first time. Visitors can view the subtle and profound garden as the illumination makes it stand out. Visitors can enjoy the “world of traditional Japan” while listening to a koto harp performance. There are also shops near the kitchen where visitors can buy Kyoto specialties and food and drink. —Open to the public for the first time. August 12 to 14, 9:00 A.M. to 8:00 P.M.
Kitano Tenman-gu Shrine, Kitano Kamishichiken, area in front of Kitanomon Gate on Imadegawa Dori, area around the Kitano shopping district. For the information of other event sites , refer the their website and the pamphlet below. At each site, visitors can purchase “Picture Postcard Strips” (100 yen each) for writing wishes and attaching them to bamboo leaves. In addition, many temples and shrines in the area will be putting up Tanabata decorations and offering special nighttime admissions.